Carter Mays’ newest client, Dana Carrington, has been given a year to live. Her prognosis didn’t come from a medical professional, but rather the handsome, charming man she met while on a business trip. After an evening with charismatic stranger, Mike Sweeney, filled with potential and intrigue, things quickly deteriorate into the most frightening and traumatic experience of Dana’s life. Presented as an opportunity to be envied, Sweeney instructs Dana to spend the next year living life to the fullest, pursuing every extraordinary opportunity she ever dreamt about. When the year is up, Mike intends to reconvene for a romantic evening that will end with Dana’s death. However, if Dana dares to contact law enforcement, her impending death will come much quicker and be far more brutal. Paralyzed by fear of the seemingly ever-present Sweeney, Dana hires Carter to protect her and stop her psychopathic suitor. In a word, I devoured this book. At the same time, I was scared out of my wits! The premise is simply terrifying – especially as a woman reader. Dana meets a handsome man on the last night of her business trip. She can’t believe her luck at first; Mike Sweeney is smart and interesting. He buys her dinner, takes her to a stage show, and then brings her back to her hotel. Neither Dana nor Mike are quite ready to say goodnight, so they go to Dana’s hotel room. And that’s when the nightmare really begins. Drugged and duct taped to a chair, Dana finds out that the man who seemed like a prince is really a monster. Mike vows to return to Dana in one year to kill her. And it seems like he has thought of everything. He shows her a scrapbook of previous victims – two who disobeyed his orders and involved the police, and one who embraced his offer of a year of life lived to the fullest – all murdered. Dana is literally paralyzed with fear. Every move she makes is monitored and she doesn’t know who to turn to for help. Together with Dana and her best friend Erin, Carter takes the case and sets about finding out exactly who Mike Sweeney is and how to free Dana from his sinister grip. I have to say that this book was terrifying to me! But in the best way. I was hooked by the story and the premise and, as scared as I was by the actions of such a cold and calculating killer, I was that much more intrigued by what would happen next and how Dana could possibly manage to be free of him. Scheduled to Die is smart and crisp; a fast-paced thriller that, I guarantee, will keep you turning the pages. 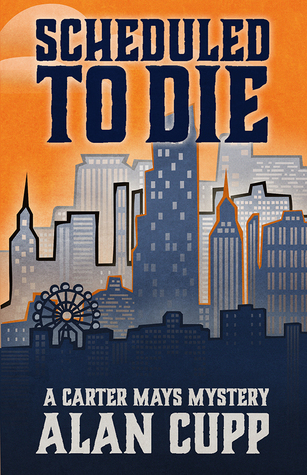 My thanks to the team at Henery Press for the gifted copy of Scheduled to Die via NetGalley. I was not required to provide a favorable review.